Popular comedian, Ali Baba has called out the Nigerian Army for treating army brutality of civilians with kid gloves. The comedian posted a photo showing a military man stepping on a civilian in a puddle, whip in hand with a crowd of onlookers. “Bloody civilian! How dare you challenge an officer. And after investigation, it would be an #unknownSoldier. Bloody civilian,” he wrote as caption to the post. 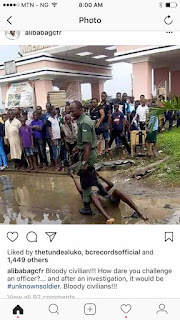 Though the time and location of the events were not stated, the photo appears to have been captured beside the rail track in front of the Nigeria Army Shopping Arena, Oshodi, Lagos.